Boy oh boy! How about that Gareth Bale? 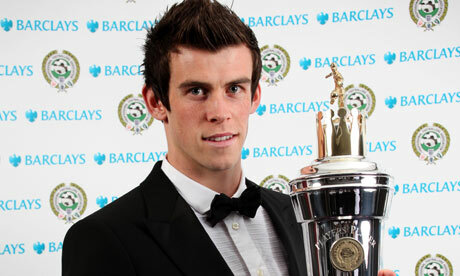 The new “Welsh Wizard”, PFA Player of the Year! bale proves that even a monkey man can look good in a tux. I’m obviously elated with my favorite player winning the award. Waking up yesterday morning to see Bale posing with the trophy, looking all spiffy in his tux, was certainly a pleasant surprise. I honestly hadn’t expected him to win the award, but then again, I wasn’t that surprised either. Bale winning the award was interesting for several reasons. First, it’s shocking to learn that he’s only the fourth Welshmen ever to win the award. That said, he’s certainly joining good company: Ryan Giggs, Mark Hughes and Ian Rush are the only others. Secondly, it’s also surprising to see he’s the fourth Tottenham player to win the award, joining club legends David Ginola, Clive Allen and Pat Jennings. It’s not so much of a surprise that any of them won it (all great and deserving players), so much as it’s a surprise that a club with so few league trophies in their cabinet has had so many Players of the Year on their books. Of course, this isn’t really defending Bale receiving the award. Like I said earlier, I wasn’t expecting the young winger to take home the prize this season. Just being nominated for the award was had me beaming with pride for the boy. And while I’m tickled pink that Gareth has won the coveted PFA prize, I’m not looking forward to the mountain of criticism he’ll receive for it. And unfortunately, Gareth’s detractors will have plenty reasons to make noise. Sure, Bale certainly pales in comparison to many of his main competitors. But there are a few problems with using statistics alone to debunk bale taking this year’s spoils. giggs didnt get as much stick when he won in 2009, even though he had worse statistics than bale. The second reason why we can’t use statistics alone to knock Bale’s selection is precedent. When fellow Welshman Ryan Giggs was voted player of the year in 2009, the Manchester United icon had only 4 goals. Whispers were that Giggs won the award more as a nod to his illustrious career than his performances that season. Something has to also be said about who chooses the award winners. Unlike most major awards, it’s not the media and pundits that choose this Player of the Year. The PFA is the union representing all of the professional players in the football league, and each union member is allowed to vote. Bale winning the award clearly shows that his peers think very highly of those performances over the least year. If you want to argue whether or not he won the award, take it up with your favorite player. So statistics aside, why else does Bale get the votes? The competition wasn’t all that stiff: Scott Parker and Charlie Adam, despite their sparkling performances, are playing for sides trying to stave off relegation. Teammate Rafael van der Vaart was red hot at the beginning of the campaign, but has since faded and can’t seem to even put in a full 90. Nasri has also gone cold after coming out of the gates on fire, probably due to being used out of position when Fàbregas returned from injury. Vidić is a defender, and they rarely get the nod despite being my pick as the most deserving. Tévez is generally bemoaned for his personality, attitude and perceived arrogance by opposing players, this despite being the most statistically viable candidate. And even though Nani should have been on this list, he’s so disliked by everyone that he could never get a vote. Bale’s low profile: By all accounts, Gareth Bale is an extremely likable kid. He’s quiet and humble, going home to mom for his holidays. Despite scoring a hat trick in the San Siro and “hailing a taxi for Maicon” at White Hart Lane, he never seemed to let it go to his head. And oh yeah, he’s British; we all know how much that trait is overvalued in the Premier League. Key performances: When Bale stepped up, he stepped up on big occasions. It’s likely that his Champions League showings, which dominated headlines for a good portion of the season, clouded the voters’ judgement. None of the other candidates can really boast a similar characteristic. So while it’s not exactly fair that a competition outside of England affected the voting for an award inside England, you can’t really ignore it either. Ok, so none of those reasons are exactly rock solid. But they are all probably reasons why Bale received so many votes from his peers. Listen, I’m not sitting here and saying that Bale undoubtedly had the best season of any of his peers. But he has had a great year, one that Tottenham supporters such as myself will never forget. and though he could very well prove to be a flash in the pan, that prospect shouldn’t minimize his accomplishments either. Let the boy have his moment. he may never get to enjoy one like it again. be as simple as “Gourmet appetizers delivered right to your door.